This isn't an official report, but is accurate to the best of my knowledge. If you spot any errors or omissions, please let me know. I have also uploaded the official "progress of business". You can refer to the conference agenda (the pack of motions prior to compositing (merging motions), emergency motions and most Executive Statements). EC statements on Brexit and Gender Identity are available on the conference page of the Unite web site. UniteLive carried reports on several debates, though some (including on an Emergency Motion I moved) appear to have been well hidden. The mood of conference was positive. In particular, the involvement of young members continues to grow. We've had young member observers for several conferences now. It was striking that we appeared to have more young member delegates this time. Certainly they played a more significant part in debates. Many had been involved in or leading campaigns and disputes, and young members significantly influenced debate on several questions, succeeding in getting the top table to respond. Less positive was the continuing excessive use of Executive Statements. The Executive Council (EC) can issue statements at any time, for insertion into any debate. Votes on EC statements are taken first, and if one is passed all the motions on the same topics fall. They have a legitimate role - effectively enabling the EC to put forward an alternative motion on a topic where they would otherwise have to oppose motions and leave us with big gaps in policy. But they are now prolific, and rarely used for this purpose, instead enabling fudge and preventing clear debate and decisions. They often help create a mood of unity in conference, but this is illusory if it is unity around a fudge which hinders coherent action in workplaces and communities. Withdrawn: the movers agreed to withdraw the motion, which was not debated. In many cases motions are withdrawn in favour of Composites that include most/all of their points. See also my Glossary & Jargon Buster. Conference notes the Football Lads Alliance (FLA) is attempting to organise football supporters in demonstrations against 'extremism'. It is taking legitimate concerns around terrorism and then using Islamophobia to stir up fear, division and racism. It represents a dangerous development on the right of British politics. Whilst claming to be against racism, within their ranks they seem happy to harbour known and organised racists and fascists many who have previously or still are active in groups such as EDL, BNP and the likes. On one demonstration Diane Abbott MP was picked out as a target by one of their leaders where they disgracefully said "Diane Abbott we are coming for you". Some from within the FLA marches have abused and threatened anti-racists from Stand Up To Racism campaign (SUTR) who were leafletting their demonstration. The FLA Facebook group moderators tolerate hate speech from their supporters against women; against Muslims; against Black and ethnic minorities. It would be wrong to identify all those who are attracted to FLA or who have marched with the FLA as racists and Islamophobes, however there is a danger that if the group goes unchallenged that those elements within it who are pushing a racist agenda are able to mobilise a new far right street movement. 1) The racist march of about 15,000 in London on 9 June, was the largest mobilisation of the far right in the UK since the 1930s and the counter-demonstration called by Stand Up To Racism was small. 2) That it followed large racist demonstrations in several cities in previous weeks, which were followed by racist attacks. 3) The rise in mainstream Islamophobia from politicians and the press and the scapegoating of migrants for problems in employment, housing and public services. Support, publicise and mobilise attendance at the demonstration called by Stand Up To Racism on Saturday 14 July against the next major far-right mobilisation in London, and any future far-right marches in our towns and cities and that trade unions should provide stewarding instead of relying on the police to keep people safe. Educate our members about the rise of Islamophobia and the racism of the FLA and DFLA and other similar groups, and by distributing information to all our branches and members. Run a campaign to encourage all football clubs, football fans and supporters' clubs to take a stance against groups such as the FLA and the DFLA and encourage and provide resources to Kick Racism Out of Football and Show Racism the Red Card. Write to the TUC to demand it launch a 'jobs, homes not racism' campaign to unite the wider trade union movement and to campaign effectively against the far right. This should include workers taking all legal steps (up to and including strike action) to disrupt all attempts to organise for hte purposes of extending the rhetoric of the FLA and DFLA or any similar organisation. Note: the importance of it became even clearer on 14 July when RMT and Unite trade unionists were physically attacked after a demonstration in support of "Tommy Robinson" (Stephen Yaxley-Lennon) and Donald Trump. Comment: I moved M13, from my own branch, and was disappointed that the EC knocked out what was primarily an equalities motion using its Brexit statement, which failed to clearly defend the rights of workers and members who may have travelled or decide to travel. When Unite materials talk about workers' rights under Brexit, the rights of current and future members who aren't UK citizens barely get a mention. Membership at TGI Fridays has rocketed in response to the (highly profitable) company wanting to take a huge chunk of tips off waiting staff to subsidise low pay for kitchen staff. Members at several restaurants were on strike during the conference. Delegates joined a protest at the Brighton restaurant and engaged in a bit of direct action, with Len McCluskey addressing diners to explain the dispute. For more information see #AllEyesOnTGIs. Comment: this was a significant debate, which unfortunately I missed due to industrial business. 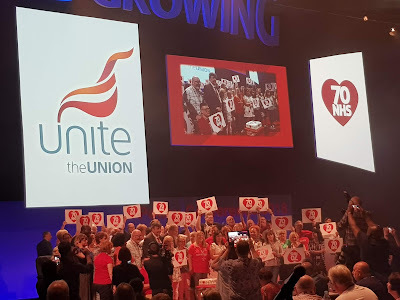 I am told that young members made a key contribution, particularly in criticising the decision of leading figures in Unite signing a one-sided letter to the Morning Star with notorious transphobes. Len responded with a clarification. Many others signed responses such as this and this from delegates at the TUC LGBT conference. Thankfully, despite the distraction of the letter, Unite now has policy supporting the rights of trans people. Conference marked the 70th birthday of the NHS and recognised the importance of defending and improving it. Comment: this important motion from the GPM&IT NISC aimed to address a situation where sectors are scattered across the allocations of dozens (hundreds in many cases) of Regional Officers. It was remitted after assurances that the issue would be addressed. Comment: conference overturned the EC, who were hiding behind bogus GDPR data protection arguments, on this motion, which is vital for effectiveness at workplace and branch level. Comment: again conference overturned the EC. The motion was to stop members being moved between branches and regions without branch officers being kept informed. Though it wasn't discussed at conference, delegates were given copies of an updated Unite Rulebook. The changes are a response to the new GDPR Data Protection legislation. Delegates were provided with copies of a new Unite Anti-Fracking Toolkit. This should be going on the Unite web site soon. For now I've uploaded a copy myself. As ever, much of the value of attending conference is the informal discussions with other attendees, from which you learn as much as the debates, and can get things done. I spent a fair amount of conference discussing the unresolved dispute at Fujitsu, particularly given that the company sent proposals shortly before conference began. I was dismissed in January (see the "reinstate Ian Allinson" statement) but am still actively involved in the dispute and, as a victimised worker under Rule 6, was still able to attend conference. Reps in Fujitsu post updates on their web site from time to time: tiny.cc/fujitsudispute.